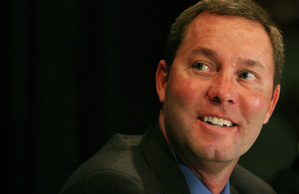 The LPGA Tour has picked Michael Whan to be its new commissioner, turning to a former marketing executive in golf and hockey equipment to rebuild the tour’s relationships with sponsors. Whan previously worked for TaylorMade and Wilson golf companies and most recently was president of Mission-Itech Hockey. “I was that crazy high school kid cutting greens at 5:30 in the morning so he could play free golf in the afternoon and caddying on Sundays,” Whan said Wednesday, during an introductory news conference at Madison Square Garden. Whan will start in his new job next January. In the meantime, acting Commissioner Marta Evans will continue to run the LPGA. Sal Johnson at Golf Observer notes how the LPGA’s PR department dropped the ball on the announcement of their new Commissioner and maybe attributing this to their recent letting go of VP Connie Wilson. Sal, whose views I have come into disagreement with in the past, may be right. Connie did a mostly thankless job at LPGA HQ for a long time. I had some interaction with her on the phone and via email, and for the most part it was good. She would always answer my inquiries promptly. If Connie was still around in Daytona, the announcement about Whan would most likely have been handled better. That said, I’m going to cut the LPGA and its new Commissioner some slack at this time. The Bivens era was a disaster, and I was very critical almost from the beginning. Ladies professional golf right now is facing its worst ever crisis. I want the LPGA to succeed and prosper. Whan has a very difficult road ahead of him to accomplish that. At this point I don’t know if he’ll be successful, but I do wish him good luck. Also blogging on the hiring of Michael Whan- Ryan at Waggleroom and Stephanie Wei.